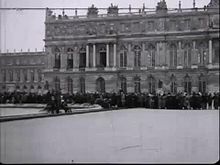 The Treaty o Versailles (French: Traité de Versailles) wis ane o the peace treaties at the end o Warld War I. It endit the state o war atween Germany an the Allied Pouers. This page wis last eeditit on 7 Juin 2015, at 11:24.